2- 532 Palestinians were wounded, 404 of them in the west bank, 52 of them wounded with live bullets and 67 with rubber bullets and 280 suffered suffocations with tear gas and 5 of them were beaten. 128 injuries in Gaza, 60 of them with live bullets and 30 with rubber bullets and 38 suffered from suffocation with tear gas. 3- Raids and arrests were carried out in separate areas in the West Bank, 13 young Palestinians were arrested from Jerusalem, Ramallah, Bethlehem and Jenin. 4- The 13 reservist brigade force of border guards were sent to Jerusalem and the occupied 48 in addition to the 4 new brigades in the West Bank and 4000 police and special forces in Jerusalem are still widely spread on the main streets and on check points in different areas. 5- Continuous clashes with the occupation forces that begin at noon and continue until midnight in more than 50 sites in the West bank and Gaza and in the 48 occupied Palestine. The clashes include stones throwing and Molotovs in: Kharsa, BeitForiek, Khodoriperimeter, HalhoulBrigde, Tareq Ben Ziad area in Hebron, Ras Al- Amoud neighborhood, Al- Toor neighborhood, Al- Issaweieh, Al-Ram, Qalandia’s checkpoint, Shu’faat, , Al- Izarieh, Abu Deis, Hizma, Al- Shayiah neighborhood, Salman Al- Faresih Street, Qatnah village northwest of Jerusalem, Al- Sa’diyeh and Bab Hutah, , Al Dheisheh Refugees Camp, Beit Eil’s Checkpoint, around Al- Maydan square southeast Hebron, BeitNeim and Halhoul and Soreef villages, Al- Aroub Refugees camp, Al-Shuhada’ street in the center of Hebron and the east of Al- Breij Refugees camp in the center of Gaza near BeitHanoun crossing. 6- The occupying forces have continued to target medical personnel reporters said, an ambulance vehicle was directly targeted and injured medic Jawdat Al-Mohtaseb at the northern entrance to the city of Hebron. Also, the occupation forces stormed the town of Makassed Hospital in East Jerusalem, causing the injury of seven Red Crescent officers with tear gas grenades while they were trying to help the citizens that were shot by the Israeli forces in Farahin area, east of Khan Younis. In a separate context, the occupation forces detained five journalists at the northern entrance to the city of Bethlehem and had them searched thoroughly. Also the Israeli soldiers repressed press crews in attempt to prevent them from covering the confrontations in the town of Tekoa, south of Bethlehem. The journalist Mohamed Aruri was injured by a rubber bullet in the clashes raging in Berh in the vicinity of Beit El checkpoint while covering confrontations there. Also Palestine TV cameraman Nabil Abu Dieh was shot in the foot while he was covering clashes near Beit Hanoun. Here the media were directly targeted by the occupation forces with bullets and tear gas. 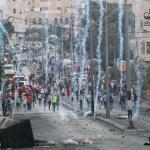 A number of them were injured, including Muthan al-Najjar who suffered tear gas suffocation. 7- Continuous daily attacks are carried out by settlers against citizens and Palestinian farmers on the main roads and villages’ entrances that are present near the settlements. Many Palestinian familys have been assaulted by settlers in their olive fields in the town on Silwad. and curse him, then he followed him accompanied by an Israeli soldier, and then shot him. They prevented the ambulance from getting to him and left him to bleed to death. B. Young Motaz Ahmad Hajez Weasat, 16 years old, was shot several times by the Israeli police near the Armon Hntseef settlement that is built on Palestinian territories in Al-Mokaber Mountain in Jerusalem. According to Israeli sources some Israeli soldiers shot him dead after a settler told the soldiers that the kid was suspicious as he was carrying a bag and smiling. (This according the the Yodot Ahrnot news paper). C. Young girl BianImanIsaleh, 16 years old, from the valley of Al-Groos near the settlement of Kiriat Arba in the middle of Hebron, was shot dead by the Israeli forces near the Ibrahimi Mosque for allegedly trying to stab an Israeli soldier. D. Young Omar Mohamed Al-fakeh, 23 years old, from the town of Katanna Northwest of Jerusalem was shot dead by the Israeli soldiers. E. Young Tariq Ziad Natsheh was shot in Al-Shuhada street in the middle of Hebron city on the excuse that he was allegedly trying to stab an Israeli soldier. According to eyewitness a group of settlers denied the ambulance that was carrying him to reach the hospital. 2. 86 injured civilians: 76 of them are from the West bank , 10 injured in Gaza. 6 of the injuries were with live ammo, 27 with rubber coatd metal bullets and 53 are from tear gas suffocation. 3. 8 young palestinians were detained in Jerusalem. 4. On going confrontations with the Israeli forces start of in the afternoon and keep going until midnight in more that 20 locations of the West Bank and Gaza and in the occupied Palestinian lands of 48. They include: throwing stones and Molotov cocktails and stabbings that were focused in: near the settlement of Biet Eil north of Al-Bireh, Bab Al-Zawiah in Hebron , Ras Al-Gorah , BietForeek , Al-E saweh , Bait Hanon , north of Bethlehem , Al-nikarah west if Qalqilah , Salah aldeen street , East of Al-Breeg camp , Hizma , Ras Al-Amood neighborhood , East of Al-Shajaia , Deer Kdees West of Ramallah , Bait Awa , Qlandia checkpoint , Bdris , Al-Esawiah and many other neighborhoods in Jerusalem. 6. The Israeli forces have continued targeting the medical crews. The Israeli forces targeted an ambulance belonging to the Palestinian Red Crescent with tear gas, East of Al-borig. This led the Ministry of health to condemn the action. 7. Continuous daily assaults by settlers at Palestinian civilians and farmers on the axis of the main roads and in villages located near settlements. A group of settlers and Israeli forces have raided the house of Mofeed Al-Shrabati in the area of Al-Shohada street in the middle of Hebron were the young Fadel Al-Qawasmi was executed there this morning.